Export the SEO Check of this URL as a PDF document. You can upload a custom logo file for this report. Hint! Improve the page response time. Hint! Promote your page in social networks. Show your SEO score to your visitors using the Seobility widget. The widget always displays the current SEO score of your homepage. Alle items met de tag: 'Our Finest Hours' welke er geplaatst zijn op PFSquad.NU. There are no problems in accessing the website. 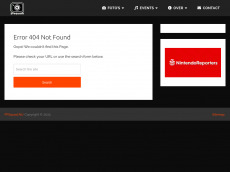 There is a valid canonical link specified. There are no alternate links specified on this page. There is no rel next meta tag on this page. There is no rel prev meta tag on this page. The domain is no subdomain. The domain length is good. The domain does not contain non-latin characters. No parameters were found in the URL. No session ID was found in the URL. The URL does not have too many subdirectories. The charset encoding (UTF-8) is set correctly. The doctype HTML 5 is set correctly. The doctype is placed at first in the HTML code. The favicon is linked correctly. description Alle items met de tag: &apos;Our Finest Hours&apos; welke er geplaatst zijn op PFSquad.NU. twitter:description Alle items met de tag: &apos;Our Finest Hours&apos; welke er geplaatst zijn op PFSquad.NU. og:description Alle items met de tag: &apos;Our Finest Hours&apos; welke er geplaatst zijn op PFSquad.NU. Test up to 1.000 webpages of pfsquad.nu with our free plan! No trial. It's just free! There are only 85 words on this page. Use at least 250 words to provide useful information. Words from the H1 heading are not used in the page content. Only 1 paragraph/s was/were found on this page. 16.5% of the text are stop words. Keywords used in the page title are also used in the page content. That's good! The page contains a listing, which indicates a good text layout. There are no duplicates on the site. The average number of words per sentence of 23 words is good. This website does not use a frameset. A viewport "width=device-width, initial-scale=1, maximum-scale=1" is provided. At least one Apple touch icon is specified. The usage of strong and bold tags is perfect. We recommend the use of up to 6 tags for this page. No images without alt attributes found. There are only a few social sharing widgets on the page. Make your website popular in social networks with social sharing widgets. This website has Google authorship information. No ads were found on this page. This website uses HTTPS to protect privacy and integrity of the exchanged data. All included files are also transferred via HTTPS. The H1 heading is perfect. The heading structure is perfect. Some anchor texts are used more than once. The amount of internal links is ok.
None of the anchor texts is too long. All internal links don't have dynamic parameters. There are 5 external links on this page. This website does not redirect. No X-Powered HTTP header is sent. This website uses GZip for compressed data transmission. The page response time of 0.63 seconds is longer than the recommended limit of 0.4 seconds. A high response time unnecessarily slows down search engine crawling and results in bad user experience as well. A Content Delivery Network like Google Hosted Libaries can save bandwith for the JQuery files. This website does not require any CSS files. The file size of the HTML document is fine (59 kB). This website is not classified "for adult only". This website is not listed on the Shallalist. This website has only a few links from other websites. This website only has backlinks from 1 referring domains. This website only has 1 backlinks. This website only has few backlinks from 1 different ip addresses. This website is not very popular on facebook. This website is listed on Webwiki. No links from Wikipedia were found. Only the data for the given URL is shown. We cannot determine the social actions for a linked fan page. Alle items met de tag: &apos;Our Finest Hours&apos; welke er geplaatst zijn op PFSquad.NU. Seobility found the following keywords. You can check the keyword optimization of this page for each keyword.